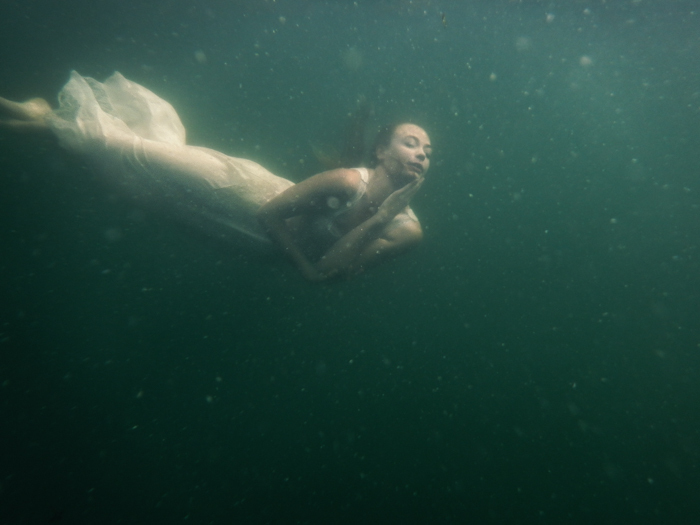 Go behind the scenes of the “Survivor Bride” underwater photo shoot and see how the photography was created. 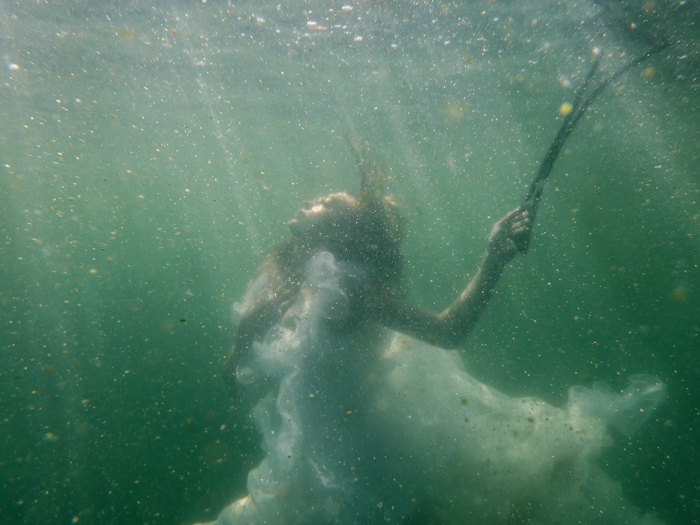 Go to minute 1:45 to view the first ever behind the scenes underwater video clips of our “Survivor Bride” shoot. My father used to tell me bedtime stories that exsisted under the water of this lake. I imagined a whole world there. I feared monsters. I wished I was a mermaid and pretended for hours in the water. The “Survivor Bride” photo shoot itself was rather dangerous. 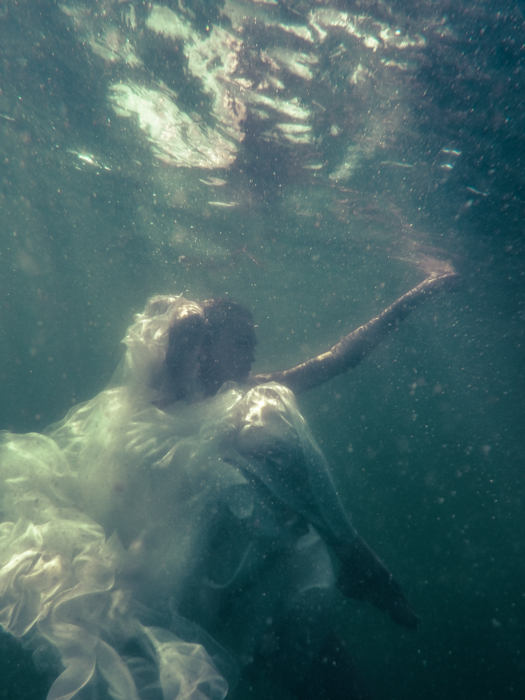 I knew it would be after hearing a story of a bride drowning in her trash the dress photoshoot. I passed on my fears about the heavy dress in the deep water. 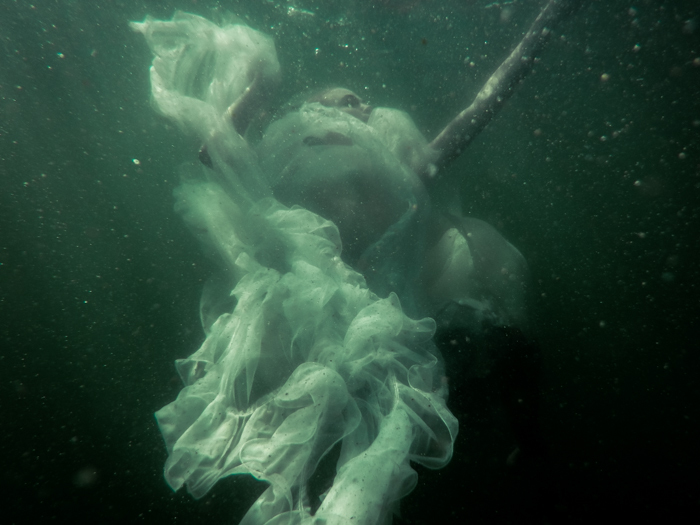 Joely realized the real danger after feeling the weight of the dress in the water and having layers of toile wrap themselves around her legs leaving her unable to kick. To add to the situation it was a windy day and there was quite a current under the water. We started shooting with her holding onto the ladder of the boat but it was very visible in the photos. So we then used a rope. We counted to 3, went underwater and then she climbed back up the rope for another breath of air. I planned to take the rope out of the photos during editing but in the end decided the real story of needing the rope to survive and her struggle with the weight of the dress and water current was more interesting. In terms of lighting I shot the first images of her in the wedding dress with the sun behind her to give a silhouette effect which also showed the rays of light streaming threw the water. I photographed her in the second dress with the light hitting her from the front to show the details of her and the dress. Between the waterfall and the underwater shooting we ended up shooting for about 12 hours. I felt as though I swam the length of the lake twice that day. But it was all worth it to see the underwater world of my childhood come to life through my brides struggle to survive and fight against the current.